*Serve with red, brown or white rice, quinoa, rice or egg noodles. *Very low in gluten and simple to prepare. This recipe is intended not to have any MSG. *To quicken the cooking time, slice the fish in to 1-1.5cm thick pieces. *Variations to the mix are possible, such as, Thai basil, laksa leaves, finely ground garlic and/or ginger. 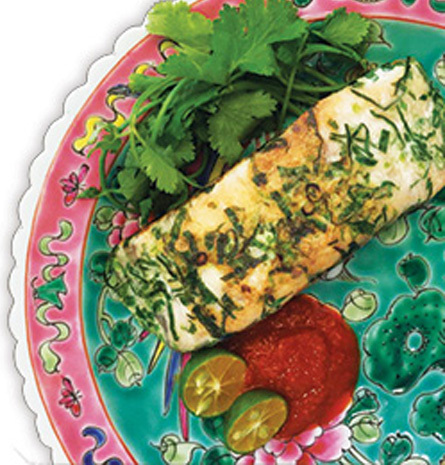 Coat the barramundi fillet with fish sauce. Set aside. In a bowl, add egg white and finely chopped herbs. Mix. Pre-heat non-stick pan at low to medium heat. Dust and evenly coat the barramundi with flour. This helps the egg white mixture adhere to the barramundi. 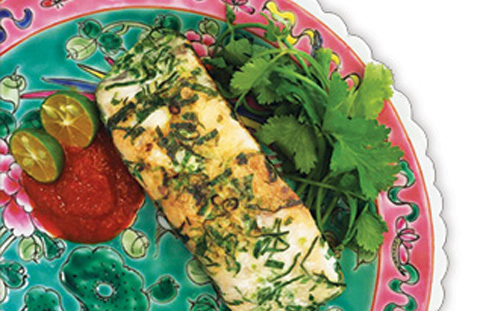 Evenly coat the dusted barramundi in a egg white mixture by carefully laying it in and turning it over. Drizzle oil in the heated non-stick pan, then gently lay the fillet. Pan-fry on each side until light golden brown, keeping it on a low-medium heat; to cook the centre of the fillet.It is cooked when the fillet is firm to the touch. Pat off excess oil and place on dish. Serve with Cilicuka Original or Cilicuka Extra Hot & calamansi lime on the side or on top.